What a great time to be planning a kitchen remodel! With so many cool new kitchen features, 2017 is shaping up to be an exiting time in the kitchen and bath industry. Here are a few of my favorite features, appliances and hardware that are making a big splash! When I first saw these at the Kitchen and Bath Industry Show a few years ago, I knew these would be a hit. These clever little pullout storage devices organize pots, pans and their respective lids, like nothing else. They even produce a pull out mop and broom organizer, and pullouts that are rated for exterior cabinetry. Also, there is a lazy Susan inspired pot and pan organizer, that can be spec’d out in new construction, or used to replace an underutilized lazy Susan. 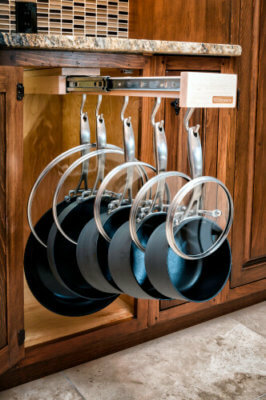 Glideware was recently purchased by rev a shelf and they join a catalog of dozens of unique storage and kitchen organization products. These are so cool. A beautiful convection oven with a decidedly commercial appearance. Clean, refined style and a unique look that will most certainly be mimicked by everyone else in the industry. You can even control the oven’s functions from your smartphone. 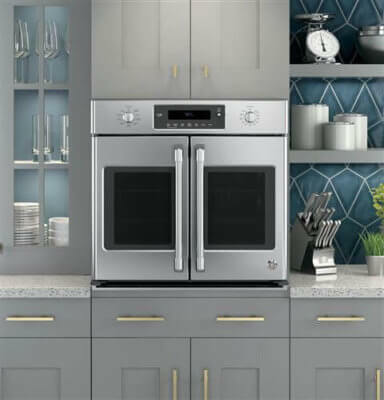 Pair this oven with a matching induction cooktop for a gorgeous, high tech kitchen. Plus, that induction cooktop can bring a quart of water to a boil in 101 seconds! Check out more specifications and features of the GE French Door Oven. While wood countertops are nothing new, they are quickly growing in popularity. We custom manufacture wood countertops in any species, size and thickness. Wood tops look great paired with stone countertops, too. Our wood countertops and butcher blocks are available in flat sawn, edge or end grain orientation. Wood countertops are also available from Records Cabinets with live edges. Contact us for more information on domestic and exotic solid wood counter tops. 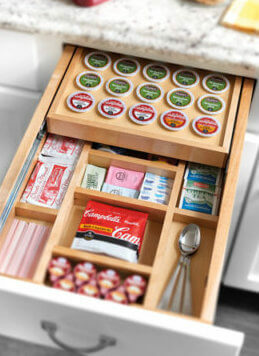 These serve a simple purpose: a tidy way to organize those tiny k-cups, tea packets and sweeteners that everybody has in their kitchen. Add in compartments for other incidentals like strainers, honey dippers, tea balls and coffee creamers and you have a great space for your morning coffee or tea ritual! These have been around a while, but we’re seeing them requested more often, especially in high end kitchens and custom built-ins. Basically, a servo drive unit will open and close a drawer or door with the slightest touch. Since the units are activated by touch, no cabinetry pulls and knobs are required, which can yield incredibly clean, uncluttered lines. More information on Blum servo drive products. These have been around a few years too, but we have these installed in the majority of our custom kitchen, desk, and mudroom projects. Basically, these neat little electrical outlets allow you to plug in your devices and keep your existing electrical outlets for more traditional duties. These can be incorporated into a cabinet, island or drawer. You can also find these without the electrical plugs, and up to four USB charging ports. A great supplier of these electrical plugs is Leviton.